An extremely agile oppponent encountered in the Grand Cathedral after fulfilling certain requirements. For detailed information on how to access this battle, check out the NPC Eileen the Crow quest. 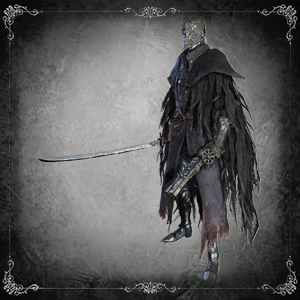 The Bloody Crow of Cainhurst wields the Chikage, a lethal weapon that inflicts rapid poison build-up in its transformed state and can deal tremendous amounts of damage in a very short time. He'll continually use an Old Hunter Bone to maintain the Quickening status throughout the fight, making him extremely difficult to hit; he'll also use Blood Vials when his health is low and will throw Numbing Mist at you to prevent you from doing the same. The Corrupted Hunter is very proficient at interrupts, and will make a deliberate effort to set you up for visceral attacks, making him one of the most dangerous hunters you'll face in single combat. Well-timed interrupts are your best chance of victory, but beware that the Bloody Crow of Cainhurst is extremely good at evading gunshots when under the effects of the Old Hunter Bone. Hitting him with a Numbing Mist will prevent him from using Blood Vials; other thrown weapons are generally not worth using as he will evade them. The fastest way to defeat him is to power up the Cannon with Bone Marrow Ash, interrupt one of his attacks with a gunshot from the Reiterpallasch and blast him with a cannon shot during the stagger state, but you'll still need to land an interrupt first. R1 combos and other ordinary melee attacks aren't very effective due to his tremendous evasive abilities, but he will frequently walk straight into charged R2 attacks if you initiate them from mid range and time the charge correctly. Latest "easy" strategy applied after patch v1.05 is to abuse his pathfinding, push the Crow out of his bounds and body block him from returning back, as seen here. Bloody Crow of Cainhurst will be located in Grand Cathedral (Blood Moon) as part of the Eileen the Crow quest. If you helped Eileen defeat Henryk, you'll find her wounded outside of Grand Cathedral. 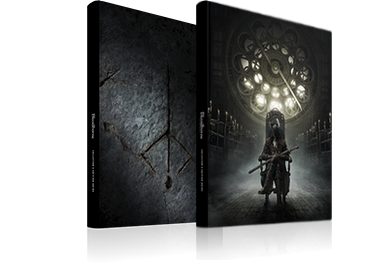 Proceed into the cathedral and defeat the Bloody Crow of Cainhurst. If you didn't help Eileen defeat Henryk, she will be waiting inside the Grand Cathedral and will attack you on sight; defeating her yields the Crow Hunter Badge and ends her quest. Data is from the unpatched version of the game so there are missing League and DLC NPCs. Blood Level doesn't match up with character's actual stats, so it is probably just for Blood Echo calculations. Stats were obtained via save-editing through hex editor.